I had the pleasure, and the honour of hanging out with Bra Hugh on a number of occasions when I lived Johannesburg as well as here in London when he visited here. A modest and honest human being, who was the same offstage as we was on, and who dedicated his life, not only to the wonderful music of South Africa but to the struggle to free its people from the evil of Apartheid. Will New ANC President Ramaphosa Bring Real Change to South Africa? You can also watch John Pilger’s 1999 film Apartheid Did Not Die on his website. Former Finance Minister Pravin Gordhan and super-consultant Iraj Abedian, two solid bourgeouis representatives, have made an unusually passionate case against what is sometimes termed White Monopoly Capital. Th[i]s surprising breakthrough indicates that corporate-state degeneracy is now so extreme, that the truth will out. Last week a conceptual barrier carefully constructed by elites since 2015 was suddenly cracked at the University of the Witwatersrand Great Hall by two of South Africa’s leading economic personalities: Pravin Gordhan, who served as a pro-business Finance Minister for seven years until being fired in March, and super-consultant Iraj Abedian, who in 1996 had co-authored the country’s post-apartheid homegrown structural adjustment programme. Two more solid bourgeois representatives would be hard to find. Patrick Bond is director of the University of KwaZulu-Natal Centre for Civil Society and is an advisory board member of Numsa’s Research and Policy Institute. The opinions expressed in this article are his own. The fast-reviving South African left is urgently coming to grips with the most acute national crises of structure and agency the country has experienced since the historic freeing of Nelson Mandela in February 1990 and the shift of the entire body politic in favor of the African National Congress (ANC) and the South African Communist Party (SACP). 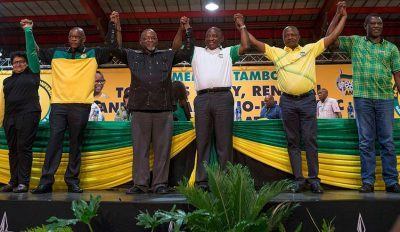 At that time, the ANC soon took control of the country’s progressive forces, winning mass social hegemony, vanquishing other liberation tendencies (Pan-Africanism and Black Consciousness), and dissolving the anti-apartheid United Democratic Front (UDF) that civil society activists founded a decade earlier. It then negotiated the first democratic election, which it won handily in April 1994 under Nelson Mandela’s leadership. Afrikaner state managers and corporate titans, as well as multilateral agencies and other forces of imperialism, demanded from the ANC an elite transition that opened both the macro- and microeconomies. Property rights were granted maximum protection, even though whites had acquired the bulk of those through what is widely termed a crime against humanity: apartheid. Read the rest of the article HERE.